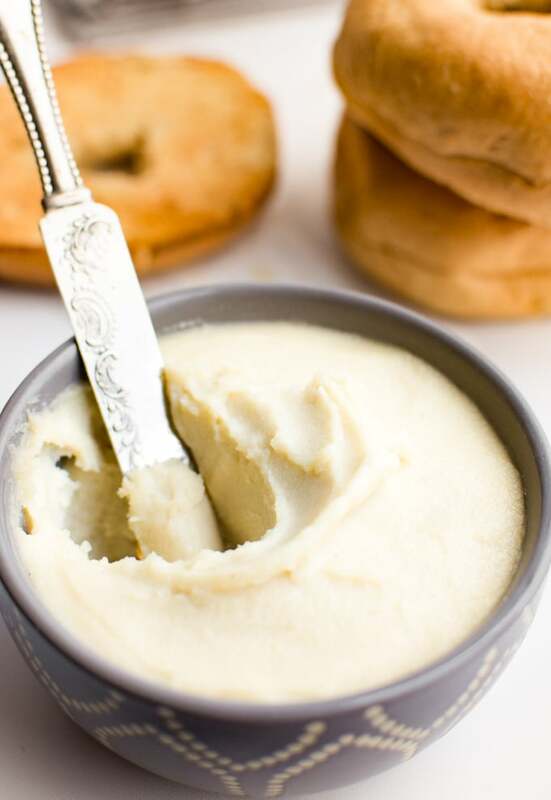 Cashew cream cheese is the perfect homemade dairy-free cream cheese alternative. It’s tangy, creamy and spreadable. Whips up in about 5 minutes and lasts all week in the fridge. 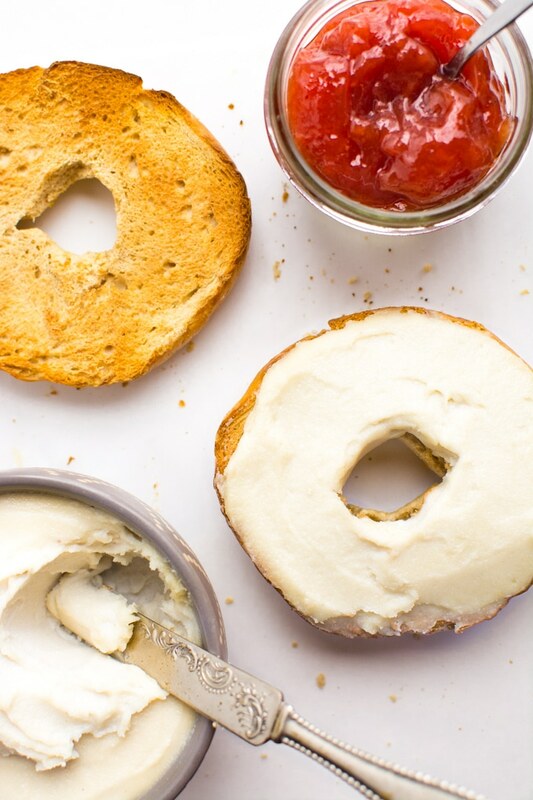 Slather this vegan spread on bagels, toast or muffins for an easy grab-n-go breakfast. 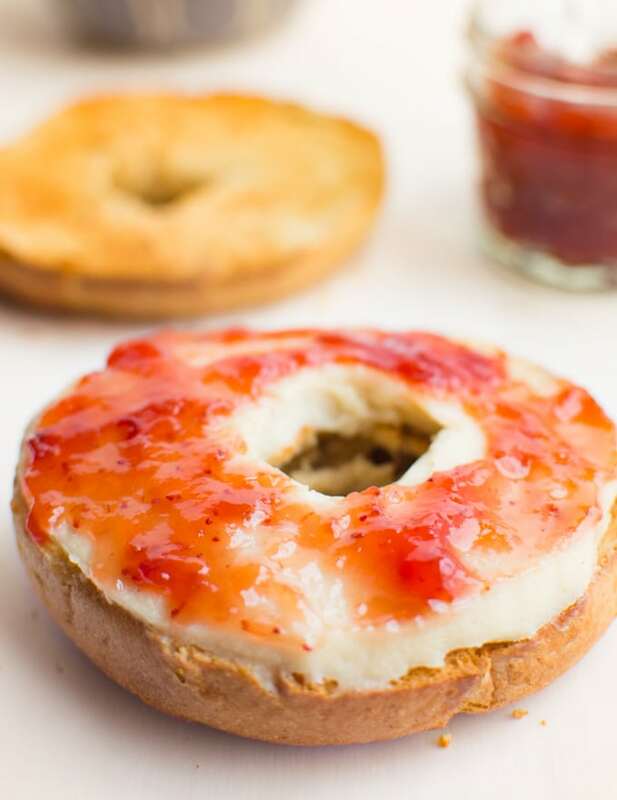 Besides banana bread, a warm toasted bagel slathered with this cheese spread is one of my favorite morning meals. It’s so easy––I call it breakfast in under 5 minutes! And lately I’ve taken it to the next level by adding fruit sweetened strawberry preserves. It’s like having a slice of guilt-free strawberry cheesecake in the morning. You’ve gotta try it! YUM! What is cashew cream cheese? 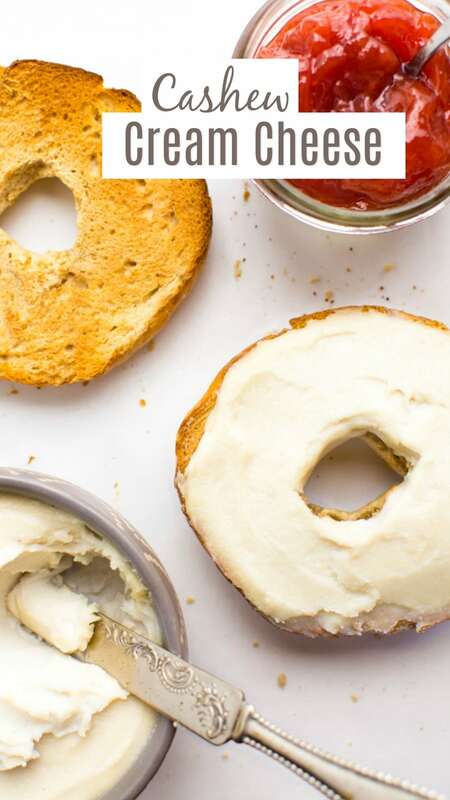 Cashew cream cheese is a dairy-free cream cheese alternative made from—you guessed it…CASHEWS! The cashews are blended with fresh citrusy lemon juice and savory Himalayan pink salt for an authentic cream cheese taste. Since ditching dairy, cashews have been a lifesaver. They’re a great replacement for some of the best vegan dips, cheeses, dressings and more (spinach artichoke dip, mac and cheese, and BBQ ranch dressing just to name a few). So, I knew the creaminess of blended cashews would be amazing as a vegan cream cheese. And I was right––it’s incredibly smooth and creamy! 1. Soak the cashews. This will soften them for a creamy spread. 2. Add the soaked cashews, lemon juice, salt and coconut oil to a food processor. 3. Process until the cashews are smooth and creamy. 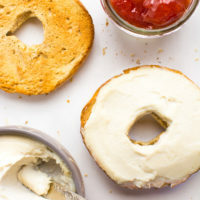 You’ve just made some of the best vegan cream cheese you’ll ever enjoy! 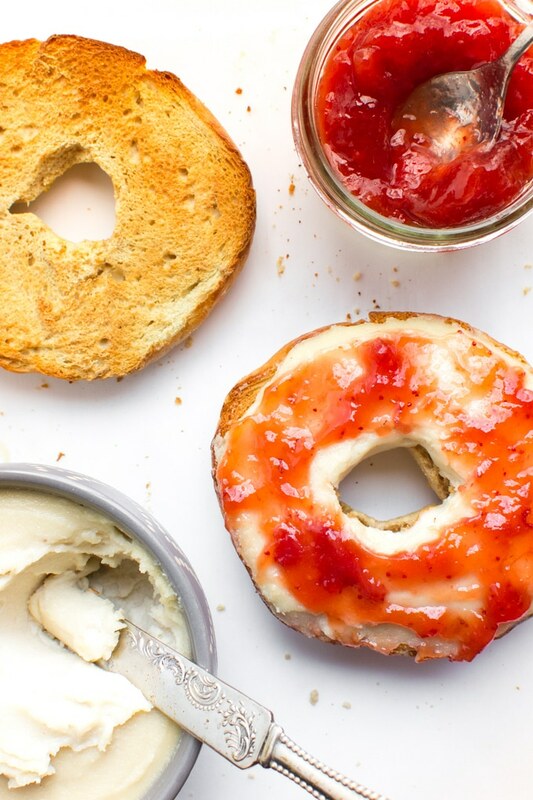 Slather it on bagels, toast, crackers, or anything else you’ve got in your pantry. Or, use it in these amazing black bean enchiladas! fruit preserves for one of my favorite combos. chives and black pepper for a savory start. apple slices topped with cinnamon and sugar. avocado and red pepper flakes for a little kick. cucumber and fresh ground pepper to keep it simple. 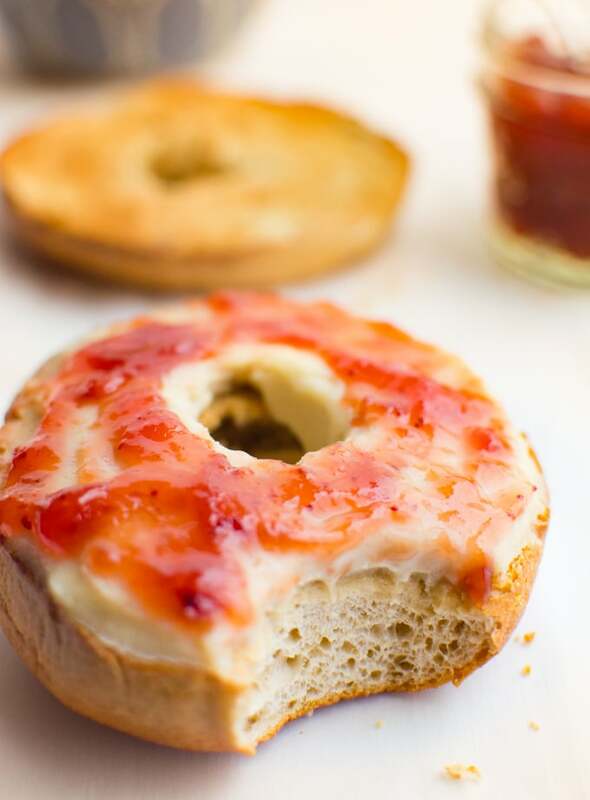 What’s your favorite bagel toppings? Let us know in the comments below! 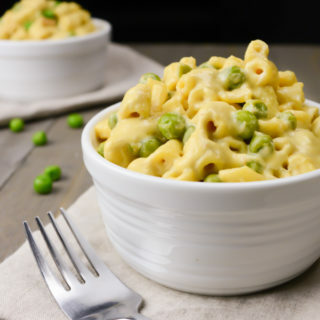 This recipe will last in the fridge for 4-7 days stored in an airtight container. YES! This cream cheese will last in the freezer for up to 6 months. Defrost on the countertop or in the fridge. If the consistency is lumpy, run it through the food processor before using. Smoothness Tip: Coconut oil adds smoothness to the cream cheese and creates a thicker spread when cold. This can easily be omitted without much change to the taste and only a slight change in the smoothness. Consistency Tip: I like my cream cheese thick and spreadable. 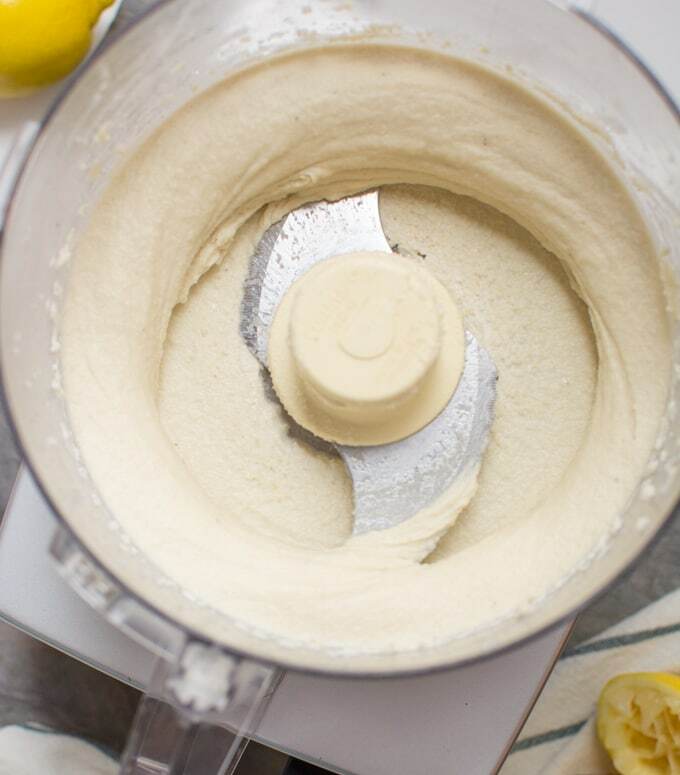 For a thinner, more whipped cashew cream cheese add a few Tablespoons of water. Remember, it will firm up a bit in the fridge. Lemon juice Tip: Start with 3 Tablespoons of lemon juice. Add more as needed for an ideal “cream cheese tang”. Depending on the lemons, I’ve used anywhere from 3 to 5 Tablespoons of juice. Sometimes more! Eureka and Lisbon lemons have more tang so you made need to use less juice. Meyer lemons are sweeter so you may need to use a bit more juice. If you loved this recipe, please leave a 5-star rating in the recipe card and share your thoughts in the comments below. Also, if you snap a photo be sure to share it with us! We love to see your creations! You can find us on Pinterest, Facebook, and Instagram. Cashew cream cheese is the perfect homemade dairy-free option. It's tangy, creamy, spreadable and whips up in about 5 minutes. Lasts all week in the fridge. 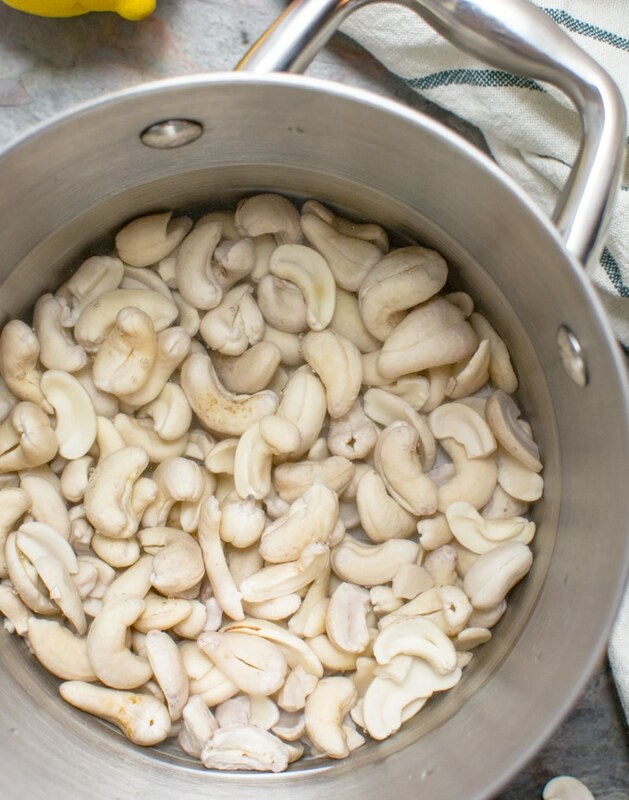 Soak the cashews by boiling 1-2 cups of water. Turn off the heat and add the cashews. Allow them to soak for 15-20 minutes or until softened. Then drain and rinse. Alternatively, you can soak the cashews in a bowl of room temp water on the counter overnight. 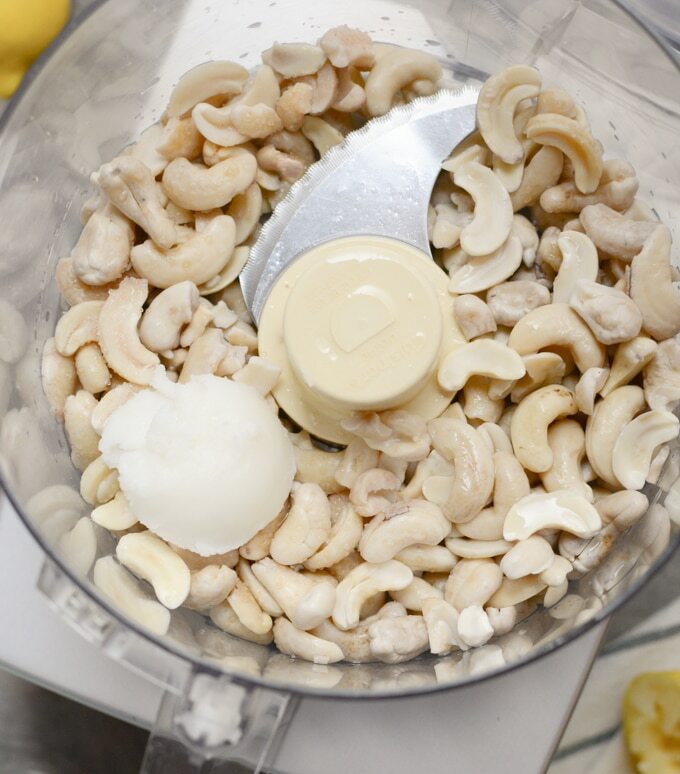 Add the soaked cashews, oil, lemon juice and salt to a food processor. Blend for 5-8 mins to achieve a creamy texture. Stop the processor and scrape down the sides 2-3 times during blending. 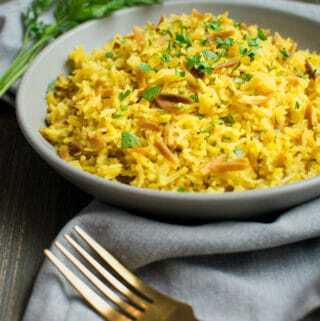 Taste and add more lemon juice or salt as needed. Place in an airtight container and store in the fridge for up to 7 days. Lemon juice: Depending on how citrusy your lemon is you may need to use more or less juice. Start with 3-4 Tablespoons and add more as needed to create a tangy cream cheese. Adding water: For a thinner, more whipped cashew cream cheese, add a 2-3 Tablespoons of water to the cream cheese after blending. Pulse a few times to mix in the water. 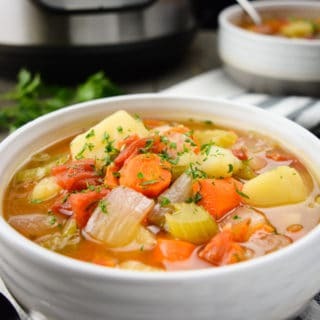 Previous Post: « 28 Vegan Instant Pot Recipes that AREN’T SOUP!